For many, Port Moody will never be considered a dining destination except for the locals. But hold on there. For those who know, there are gems to be found, if you know where to look for it. Case in point, the best roti (in the Lower Mainland, we're not comparing to the Caribbean for heaven's sake) can be found at Rehanah's while some pretty darn good purin is available at Cake-Ya. Fuji Sushi has recently relocated here and it serves up authentic Japanese fare. 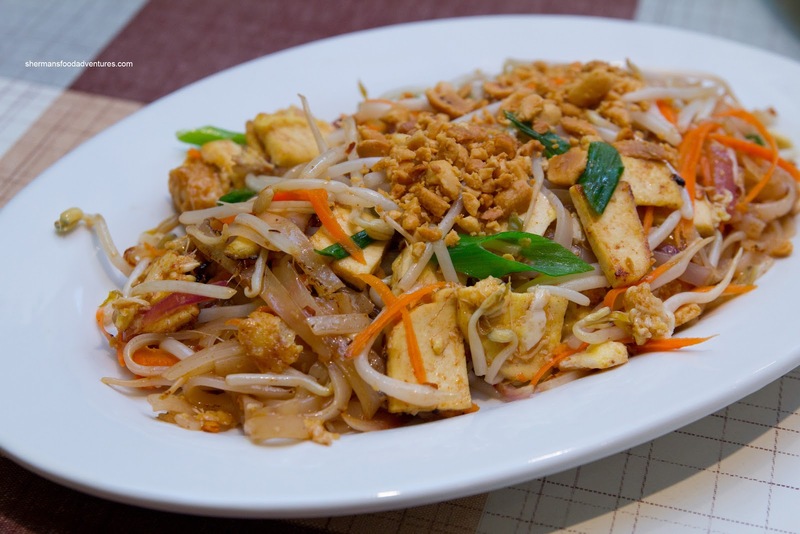 And let's not forget Kurumba with its wonderful Malaysian cuisine. Whether you like it or hate it, Rosa's is a popular destination restaurant (for pro hockey players) as well. With the aforementioned restaurants, it is almost shocking at the diversity of cuisine available and furthermore, it is not crappy either. Therefore, Port Moody needs a bit more attention from just the people who live there. Naturally, I have no problem giving a bit of love for PoMo since I will travel for food! And apparently, Big D, Slick and Smiles were up for it too... if I picked them up. Fine, anything for some eating company! Rich Guy joined us too because he lives nearby and really, he is always up for eating. 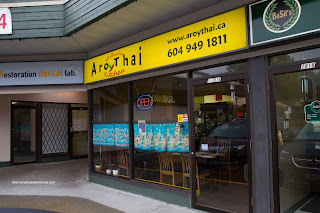 The place we decided on was Aroy Thai... Yes, there is competition for Little Thailand. 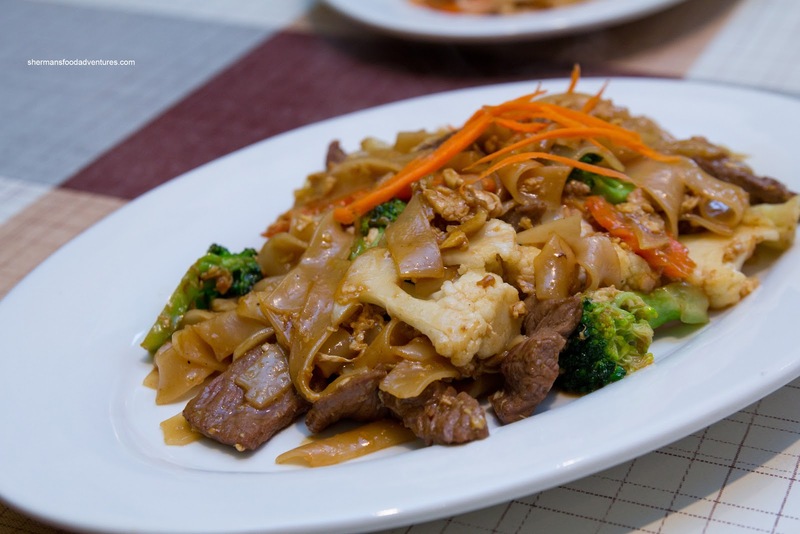 We decided to split a bunch of lunch specials beginning with the Pad See Ew. Although in abundance, we found the beef to be chewy and dry, however, the veggies were crunchy and vibrant. The noodles were seasoned nicely with dark soy, but I swear I tasted Maggi sauce in it. Onto another noodle dish being the Pad Thai, it was pretty good. It was not ketchupy and had a good level of spice. There was good caramelization of flavours while the noodles were al dente. As you can clearly see, they were not shy about adding ingredients into the dish. Next up was the Peppery Pork which was very flavourful and after a few bites, it was just plain salty. This could've been a good dish since the pork had a nice chewy, yet moist texture and there was definitely a good amount of pepper. Yet in the end, there was just too much sodium. 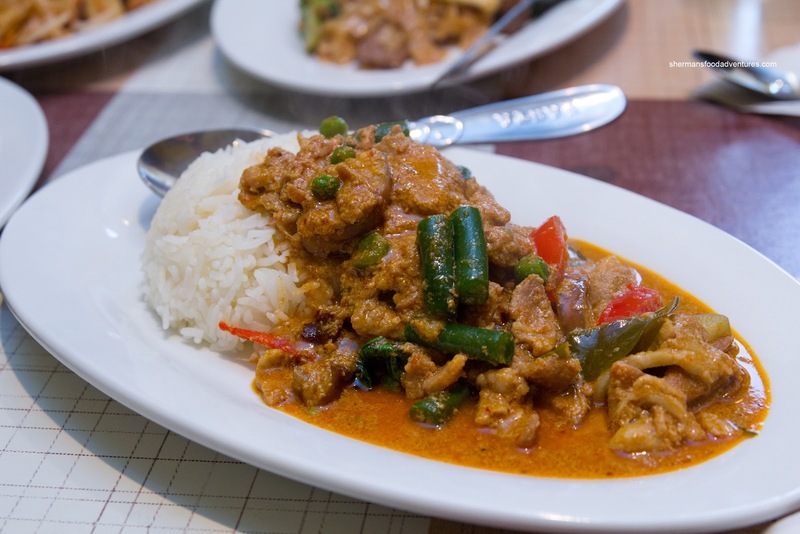 Moving onto the curries, we had one of each starting with the Pork Red Curry. 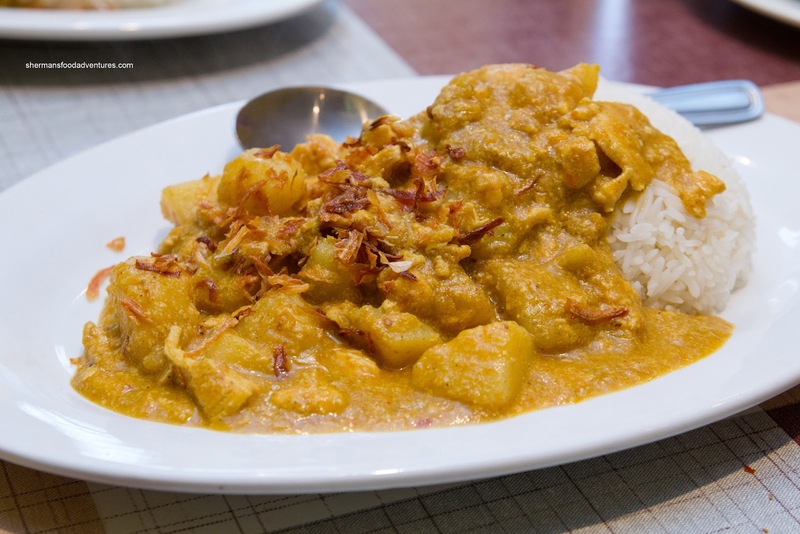 Noticeably spicy with considerable depth, the curry was thick and rich from the coconut milk. It was on the greasier side, but then again, that is probably why it was tasty. 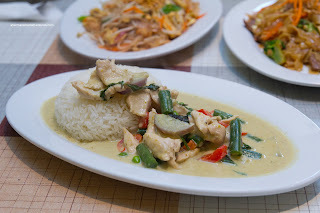 Onto the Chicken Green Curry, it had a nice consistency where it was neither too thick nor watery. Again, there was a good level of spice and we could really taste the shrimp paste. Hence, there was plenty of depth and once again, quite enjoyable to eat. Completing the trifecta of curries, we had the Chicken Yellow Curry. Unlike many yellow curries (my least favourite by the way), this one was complex with a good amount of spice. The potatoes were soft while still maintaining their shape. However, there wasn't a whole lot of chicken though. The fried shallots on top added another level of flavour. Portions were on the smallish side, considering the fact that the lunch specials were $10.00. However, we were actually pretty happy with our meal at Aroy considering the fact we went in with no real expectations. 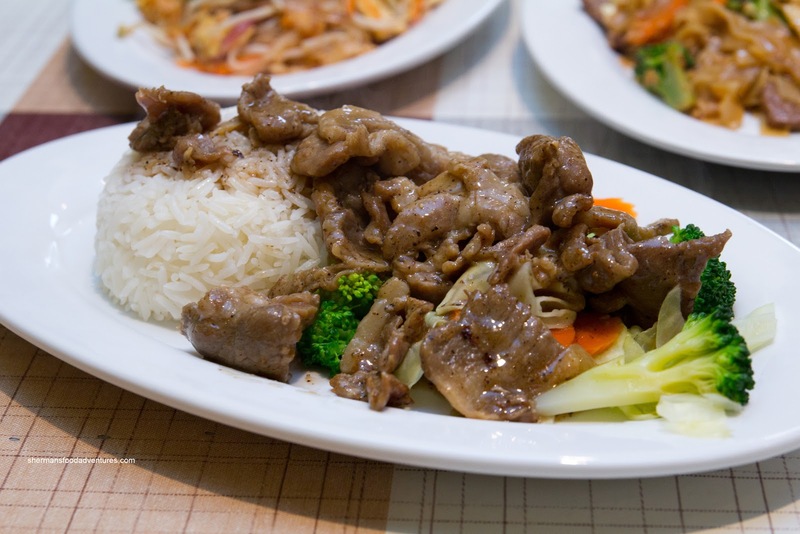 The food was generally flavourful and well-prepared (except for the salty pork dish).